Fekner’s stencil Wheels Over Indian Trails greeted motorists and international travelers arriving in New York City at the Pulaski Bridge Queens Midtown Tunnel from 1979-1990. The message remained untouched for eleven years, until Earth Day 1990, when Mr. Fekner, feeling the piece had run its course, painted over it. At the beginning of this journey years ago, I came home from road trips and saw on the rocks over New York’s Midtown Tunnel this huge graffiti: WHEELS OVER INDIAN TRAILS. I loved these painted words because they made me think: Who had walked across this same island? Who had touched the same outcroppings of igneous rock? Who had crossed the same rivers and looked out from the same ocean shore? Who had lived on the land where my house is built over an underground river, at the edge of a timeless boulder that stretches all the way to the center of the island? I came to call this vertical history more visceral, sensory, and anchored in the land than the horizontal version that disappears into the mists of time. 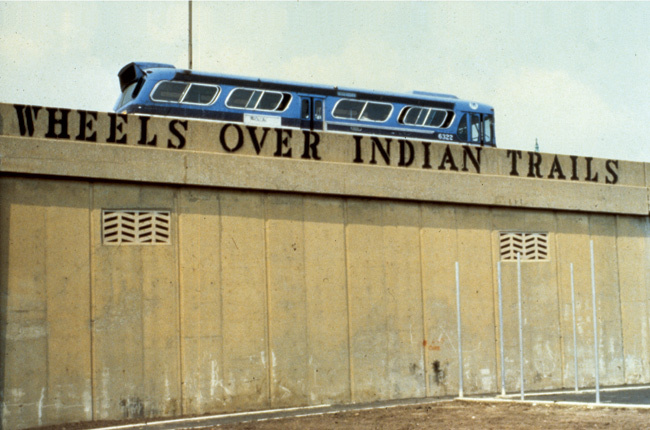 Still, I assumed that “Indian trails” meant the past and “wheels” meant the present. Now, I wonder if the writer of this graffiti meant something different. After all, trails and wheels cover the same land and could be guided by the same wisdom. These lifeways could be the wheels that will carry us all.